• Occupation: Timber industry/Carpenter Ontario, Canada. Richard ran a lumber mill in Ontario until it burned down. Perhaps pre dictably, he was also a skilled carpenter. While visiting his daughte r Mary in BC one time, he carved a Bread-making bowl for her. Richard ran a lumber mill in Ontario until it burned down. Perhaps pre dictably, he was also a skilled carpenter. While visiting his daughte r Mary in BC one time, he carved a Bread-making bowl for her. • 1851 Census of Ontario: Beverly, Wentworth, Ontario, Canada, 12 Jan 1852. 80 The Personal Census information for Beverly District is missing, but f ather John was listed in the Agricultural Census for Beverly Townshi p in Wentworth County of Canada West, p. 31, line 5, as living on Cons . 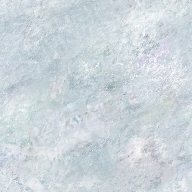 9, lot 31. He had 2 acres of land where he grew Oats and Potatoes . He had 100 lbs. of Maple Sugar, 2 Bulls or Oxen, 2 milk cows, 1 cal f, 2 horses, 2 pigs, and 1 barrel or cwt. of Pork. 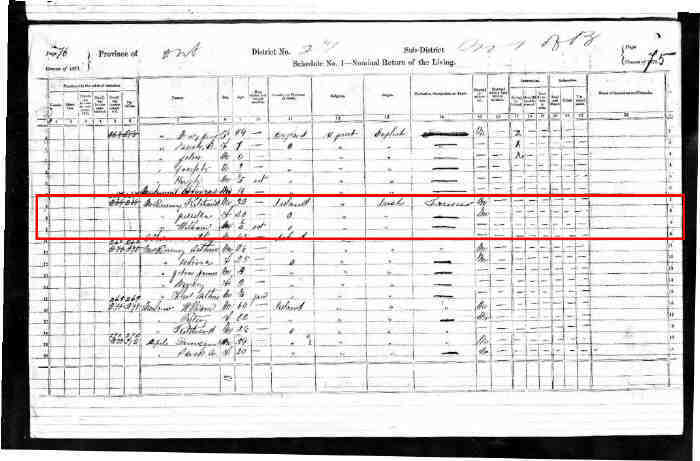 • 1861 Census of Canada: Ritchie, age 20, with father John, age 48, mother Mary, age 43, and si Kinloss, Bruce, Ontario, Canada, 14 Jan 1861. 79 blings Hugh, age 22, John, age 16, William, age 13, Thomas, age 11, Ja ne, age 10, Marg, age 7, Ann M., age 4, and James, age 1. Age 20 with father John (48), mother Mary (43) and siblings Hugh(22) , John (16), William (13), Thomas (11), Jane (10), Margaret (7), Anni e Maria (4), and John James (1). 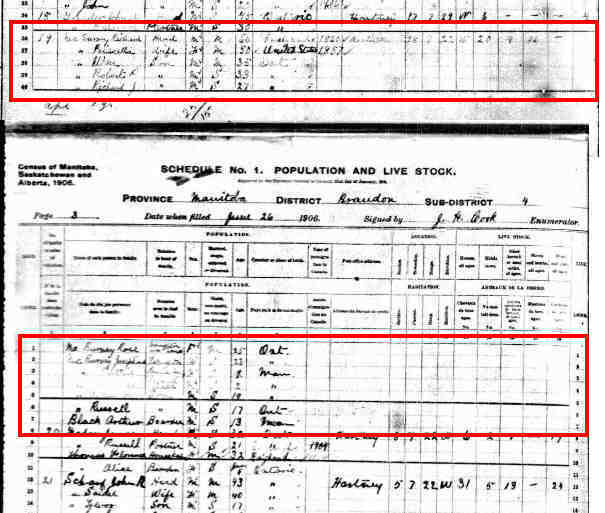 • 1871 Census of Canada: Richard, age 32, with wife Prescilla, age 20, and son William, age 6 m Kinloss, Bruce, Ontario, Canada, 2 Apr 1871. 81 onths, with Arthur Atkinson, age 45. Richard, age 32, with wife Priscilla, age 25, and son William, age 6 m onths, with Arthur Atkinson, age 45 from Ireland. 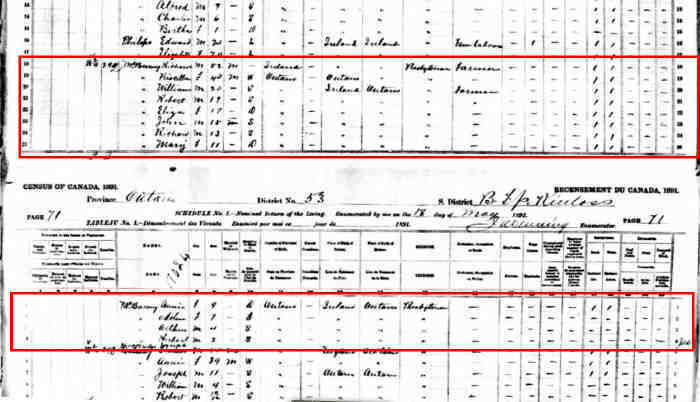 • 1881 Census of Canada: Richard, age 42, with wife Priscilla, age 31, and children William, ag Kinloss, Bruce, Ontario, Canada, 4 Apr 1881. 65 e 11, Robert, age 9, Matilda, age 7, John, age 5, Richard, age 4, an d Mary, age 2. Richard, age 42, with wife Priscilla, age 31, and children William, ag e 11, Robert, age 9, Eliza Matilda, age 7, John Albert, age 5, Richar d James, age 4, and Mary Jane, age 2. • Residence: Lot 30, Concession 6 Kinloss, Bruce, Ontario, Canada, 8 Jul 1887. 73 According to the Kairshea Tweedsmuir information, they operated a sawm ill on Concession 6 at one end of the farm. 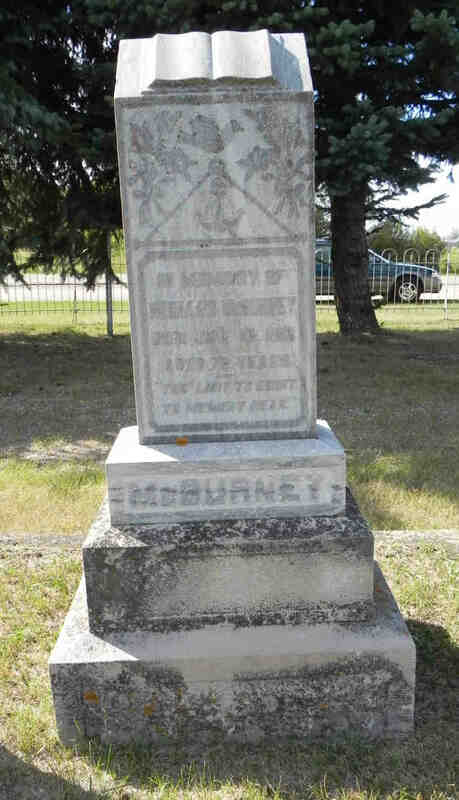 The July 8, 1887 issue o f the Lucknow Sentinel reports 'Richard McBurney's saw and shingle mil ls in Kinloss Twp. were burned on Monday. There was a loss of $1000 . The buildings were insured for $300'. In January 1892 the Sentine l reports 'a rebate of taxes to McBurney and Carter on account of thei r sawmill having burned.' The Lucknow Sentinel on January 27, 1893 ag ain reports that 'an auction sale on Lot 30, Concession 6 for Richar d McBurney on February 1. Stock and implements. Purvis auctioneer'. After the fire, most of the family moved to Manitoba (Hartney-Menteit h area) to resume farming. On March 18, 1892, as the Lucknow Sentine l reported 'a large number of locals departed for Manitoba'. One of t he six was Wiliam McBurney. The February 10, 1893 issue of the Sentinel reported: 'William McBurne y of Kincardine has rented the farm belonging to his brother, Richard . The latter intends going west in the spring'. William purchased th e farm in 1896. 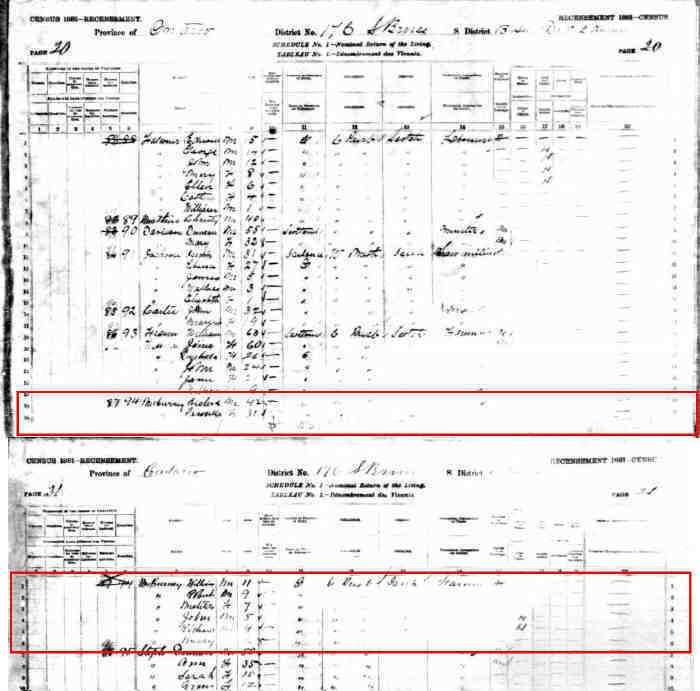 • 1891 Census of Canada: Richard, age 52, with wife Priscilla, age 40, and children William, ag Kinloss, Bruce, Ontario, Canada, 18 May 1891. 66 e 20, Robert, age 19, Eliza, age 17, John, age 15, Richard, age 13, Ma ry, age 11, Annie, age 9, Adeline, age 7, Arthur, age 4, and Herbert , age 2. Richard, age 52, with wife Priscilla, age 40, and children William, ag e 20, Robert, age 19, Eliza, age 17, John, age 15, Richard, age 13, Ma ry, age 11, Annie, age 9, Adeline, age 7, Arthur, age 4, and Herbert , age 2. 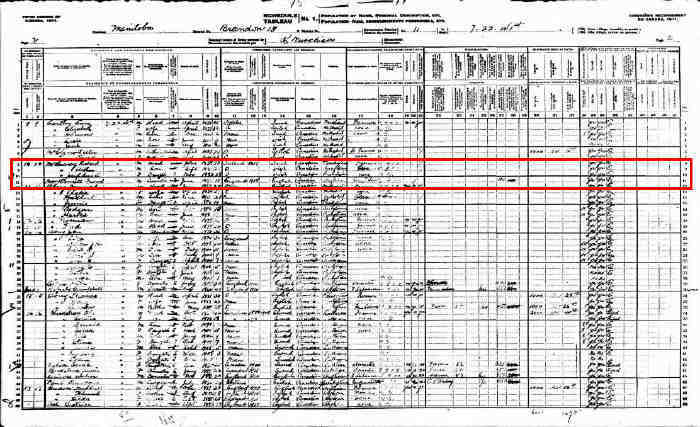 • 1901 Census of Canada: Richard, age 62, with wife Priscilla, age 51, and children Robert P. Souris, Manitoba, Canada, 10 Apr 1901. 75 , age 28, Richard J., age 22, Annie J., age 19, Adeline M., age 17, Ar thur H., age 14, and Herbert T. R., age 12. Richard, age 62, with wife Priscilla, age 51, and children Robert P. , age 28, Richard J., age 22, Annie J., age 19, Adeline M., age 17, Ar thur H., age 14, and Herbert T. R., age 12. Richard, age 60, with wife Priscilla, age 50, and children William, ag e 35, Robert P., age 33, Richard J., age 27, Josephine, age 23, Arthur , age 19, and Russell, age 17, William's wife Rose, age 25, Willia m & Rose's children Ruth, age 7, and Lawrance, age 2, and boarder Arth ur Black, age 13. 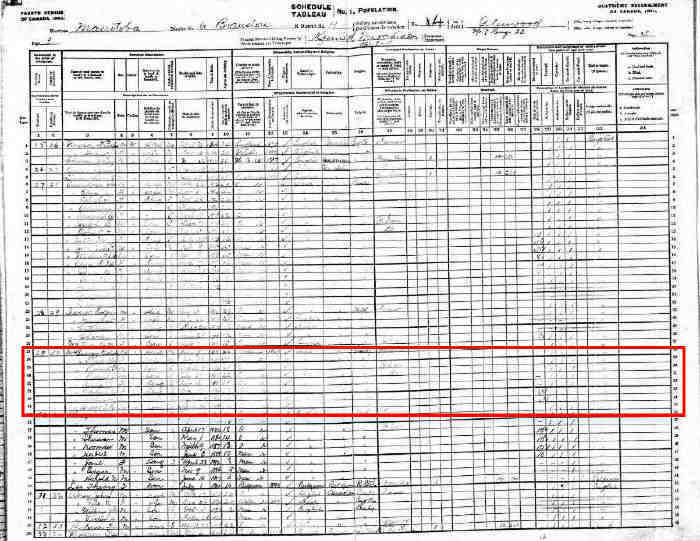 • 1911 Census of Canada: Richard, age 73, with children Josephine A., age 28, and Arthur, age 2 Brandon District, Manitoba, Canada, 1911. 76 5, with domestic Frank MacDonnell, age 15. Richard, age 73 and children Arthur, age 25 and Josephine, age 28, wit h domestic Frank MacDonnell, age 15. 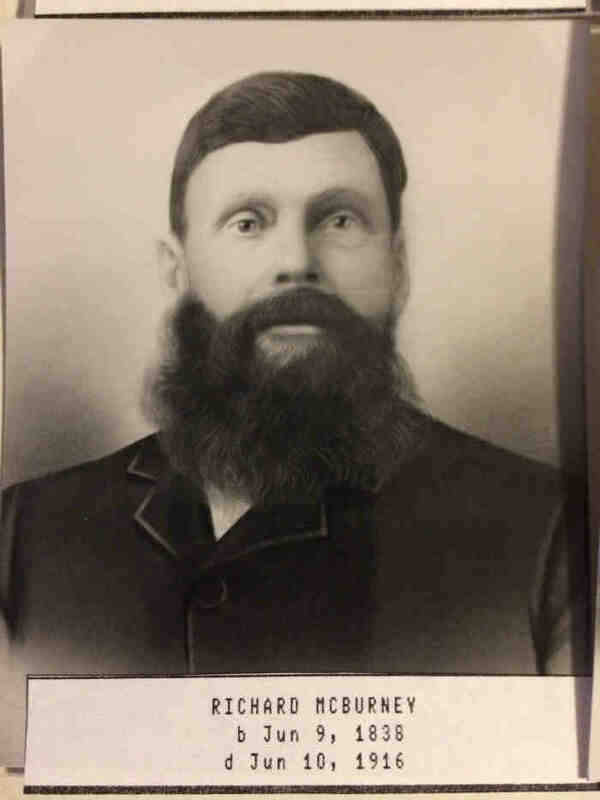 Richard married Priscilla Pettypiece, daughter of Richard Pettypiece and Elizabeth Young, in 1869 2,60.,73 (Priscilla Pettypiece was born on 31 Jul 1849 in Ashfield, Huron, Ontario, Canada,2,4,60,75,83 died on 31 Dec 1906 in Mentieth, Glenwood, Manitoba, Canada 2,4,60,83 and was buried in Jan 1907 in Hartney, Grassland, Manitoba, Canada 4,60,83.). The cause of her death was "Paralysis of the Brain", ? Stroke.